LOWER ELWHA KLALLAM RESERVATION, Wash. — The Elwha, like so many coastal Natives, are salmon people. Their history of dugout canoes and hundred-pound chinook is inseparable from the glacial river that shares their name. In late August, timed to the fall runs of fish, the Lower Elwha tribe holds the annual First Salmon ceremony at the gravelly mouth of the river. Lola Moses, who oversees the tribal court, presides over a small crowd of members, children from the reservation’s Head Start program and a few visitors. A flayed salmon rests on a plastic folding table. “I’m so proud of the Elwha,” Moses says. “The river is free. It’s cutting new paths and going down old paths.” For the first time in more than a century, there’s no concrete holding the river back. The largest dam-removal project in U.S. history has given this ecosystem and its earliest residents, the Lower Elwha people, a second chance. Historically, the Elwha was among the region’s most productive rivers, home to 10 varieties of anadromous salmon and steelhead trout. These fish are born in freshwater creeks, then spend their adulthoods mining the vast nutrients of the sea. They make a final journey home to mate and die, feeding bears, eagles and insects as they decompose. But the damming of the Elwha River for hydropower in the early 20th century — without passages for fish, in violation of an 1890 law — blocked off 90 percent of upstream spawning ground for some 400,000 fish and turned the legendary king salmon, or chinook, into myth. The Klallam (“strong”) people, like the salmon they depend on for food and spiritual sustenance, were displaced and dwindled in number. There are now fewer than 700 Lower Elwha people, according to the U.S. Census; the tribe counts approximately 1,000 registered members. In 1992, the tribe won a long battle to remove the dams and rehabilitate the entire watershed. The Lower Elwha and their federal partners — the National Park Service, Fish and Wildlife Service, Bureau of Reclamation, National Oceanic and Atmospheric Administration and U.S. Geological Survey — took the lead on this vast, $325 million project. The first blast of dynamite came in 2011; last year, the Elwha River saw its best returns of fish in three decades: 4,500 adult chinook and 1,200 steelhead, the two most critical species. Lower Elwha member Peyton Cable participates in the tribe's annual First Salmon ceremony, a ritual of harvest, in August 2014. But some of the restoration work is unfolding at a new hatchery on the Lower Elwha reservation. There, thousands of spawning adult fish are captured for their sperm and eggs, resulting in millions of artificially bred juveniles. The tribal hatchery is controversial: a dark stain upon a rare, hopeful environmental story. In 2012, a few months after the dam removal began, Wild Fish Conservancy and three other nonprofits sued to stop the Elwha hatchery from releasing so many tiny fish. The tribe itself was not a defendant in the case, but its hatchery managers were, along with several federal agencies. Plaintiffs argue that a hatchery has no role in a wild, undammed river and that the release of genetically inferior, artificially bred fish will harm varieties protected by the Endangered Species Act. They further allege that the federal government failed to consider less harmful options, such as releasing fewer manufactured fish, in planning the restoration. The lawsuit turns on a narrow scientific dispute: whether a hatchery program will support or endanger native salmon and steelhead in the Elwha. It also raises vexing, far-reaching questions: How much human intervention is needed to nurse a watershed back to health? Do culture and tribal fishing rights undermine conservation? And in a river plugged up for 100 years, is there any wild thing left? In February 1914, wealthy industrialists gathered in far-flung Port Angeles, Washington, to celebrate a new hydropower facility, the latest taming of the Northwest wilderness. The Elwha Dam, built just five miles upstream, promised electrified civilization amid scattered indigenous villages, old-growth forests and crystal rivers bubbling with salmon. To settlers, everything in sight was an unexploited resource. The Elwha Dam was constructed, illegally, of impenetrable concrete. Up the spawning salmon came, returning from the ocean, only to ram their heads against the wall. Its builder, industrialist Thomas Aldwell, knew of the state law requiring all dams to include passage for fish, but neither he nor his allies in the state government cared to comply. The protests of a local game warden and the area’s first people, the Lower Elwha Klallam Tribe, were ignored. Acres of land were flooded by the dam, and the tribe’s right to fish in its “usual and accustomed” areas under the 1855 Treaty of Point No Point was erased. Instead, two years after the dam’s completion, the state simply required Aldwell to add a perfunctory fish hatchery as a substitute for wild runs. Things got much worse. In 1927, a second wall, the Glines Canyon Dam, was built farther upriver — again, without fish passage, even after the surrounding land was named part of Olympic National Park. State-run salmon and steelhead hatcheries were built to replace the failed one Aldwell had constructed. 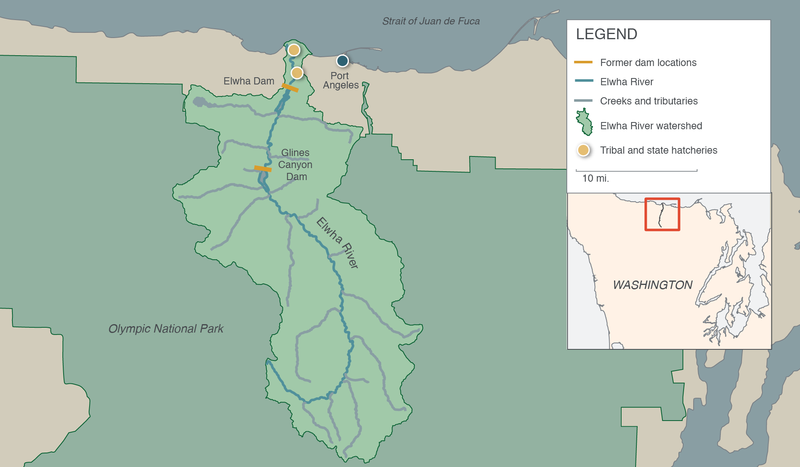 Chroniclers of the region say the Elwha deal set a bad precedent. Dam-hatchery projects became ubiquitous in the 20th-century American West. Today, Washington alone has 83 hatchery facilities run by the state, 51 by tribes and 12 by the federal government. Billions of dollars have been spent to manage and multiply fish, but salmon populations continue to shrink year after year. At the same time, well into the 1960s, state wildlife departments prevented Native Americans from exercising their treaty fishing rights. Game wardens policed Northwest rivers in favor of white sportsmen and routinely brutalized tribal fishers. In Washington, Billy Frank Jr., a civil-rights activist with the Nisqually tribe, was jailed dozens of times, and actor Marlon Brando was arrested at a 1964 “fish-in” with Puyallup leaders. The humiliations and violence of these decadeslong Fish Wars are still fresh. “My mother was on the tribal council, and she would get [Elwha fishermen] out of jail,” recalls tribal elder Serena Antioquia, 75. Later, Antioquia made sure her own children learned how to fish. Her daughter Rachel Hagaman is now a commercial fisher; her other daughter, Lola Moses, emceed the First Salmon ceremony last August. A 1991 photo of the Elwha Dam, built without any fish passage in the early 20th century. Its demolition began in September 2011. It wasn’t until a federal investigation into state enforcement of wildlife laws and a subsequent court ruling in 1974 that Olympia began to respect the tribe’s 19th-century treaty rights. U.S. v. Washington, known as the “Boldt decision” after the first presiding judge, held that local tribes are entitled to 50 percent of total catch and that, as sovereign nations, they should co-manage fisheries on equal footing with the state. The decision came down not long after the federal government granted the Lower Elwha Klallam Tribe 372 acres of reservation land along its ancient river. Encouraged by these developments, the tribe launched Klallam language and history programs in the late 1970s and established its own hatchery to augment depleted fishing areas and earn much-needed income. “We had a rotation where between 10 and 20 people from the tribe would make a living from the small runs coming through the river,” recalls Robert Elofson, the Lower Elwha’s river-restoration director and a commercial fisherman. The tribe also began to campaign for an audacious, seemingly impossible goal: an undammed Elwha River. In 1986, the tribe sued the federal government, seeking to dismantle the Elwha and Glines Canyon dams. The river’s hydropower facilities were by then nearly obsolete, producing less than half the electricity needed to fuel an adjacent paper mill. Politics had shifted, too: Native Americans were key players in natural-resources management; fishing rights were federal law. And environmental activists inspired by the civil rights movement were calling for wasteful, outdated “deadbeat dams” to be demolished. The Elwha Dam in August 2011, just before removal began, and again in March 2012. Feelings were just as strong on the opposing side; business interests and old-timers in town clung to what the dams represented. They felt a deep nostalgia for the industrial dream of Port Angeles and the tamed version of nature — lakes and dykes and hatcheries — that a man-made Elwha had introduced. “Early on, when they were talking about removing the dams, it took me a long time to buy into it. There was an ecosystem that had evolved over many, many years. There were a lot of birds nesting on those lakes,” says Arnold Schouten, a local surfer and business owner. After years of lobbying and debate, the tribe and its allies prevailed. Congress passed the Elwha River Ecosystem and Fisheries Restoration Act [PDF] in 1992, authorizing the “removal of the dams and full restoration of the Elwha River ecosystem and native anadromous fisheries.” It was a historic win, though it would take nearly 20 years of negotiation, planning and study before the first pieces of the dams fell away. The Lower Elwha tribe has played a critical role in the river-restoration project. Its team of scientists has worked with the National Park Service and other federal agencies to study virtually everything in the watershed: salmon, river otters, elk, birds, vegetation, boulders, logjams and the sediment coming downriver. Salmon, above all, have always been the focus — wild fish, primarily, but hatchery fish, too [PDF]. On Sept. 16, 2011, the day before a celebration marking the inaugural dam blast, the tribe and its federal partners received a notice of intent to sue [PDF] from lawyers for Wild Fish Conservancy. The tribal hatchery, they alleged, had violated the Endangered Species Act and ignored the “serious ecological risks that hatchery fish pose to native salmonids.” By February 2012, the case had begun its long journey in federal court. Sources: “2014 Elwha River Chinook Escapement Estimate Based on DIDSON/ARIS Multi-Beam SONAR Data” by Keith Denton et al., courtesy Lower Elwha Klallam Tribe; “2014 Elwha River Steelhead Escapement Estimate Based on DIDSON/ARIS Multi-Beam SONAR Data” by Keith Denton et al., courtesy Lower Elwha Klallam Tribe; George Pess, National Oceanic and Atmospheric Administration; Olympic National Park; Washington Department of Fish and Wildlife; “Summary of coho salmon redd surveys in middle Elwha River 2013/2014” by John McMillan et al. (2014); “Biological impacts of the Elwha River dams and potential salmonid responses to dam removal” by George Pess et al. in Northwest Science (2008); “Guidelines for Monitoring and Adaptively Managing Restoration of Chinook Salmon (Oncorhynchus tshawytscha) and Steelhead (O. mykiss) on the Elwha River” by Roger Peters et al., U.S. Fish and Wildlife Service (2014); “A comparison of pink salmon in Elwha and Dungeness rivers and Morse Creek using microsatellite DNA” by Maureen P. Small et al., Washington Department of Fish and Wildlife (2005). About 500 people, more than half the Lower Elwha, live on tribal land. To outsiders, there isn’t much on the reservation: grassy fields; small, widely spaced houses; a community center resembling a high school. There’s no giant casino or outlet mall or crafts emporium as on larger reservations near Seattle. Most Elwha members are poor, though precise statistics are unavailable. In the late 1980s, the tribe commissioned an economic analysis of what it had lost in fishery revenue from the dams. The figure was $168 million — “and I thought that was conservative,” says Eric D. Eberhard, Indian law practitioner in residence at Seattle Pacific University. Salmon and shellfish have always been the tribe’s main economic asset: At the famed Pike Place market in Seattle, fresh chinook sells for $40 per pound. In Washington, salmon is a $1 billion business. Before the dams were removed, no one really questioned the existence of the state or tribal hatcheries, which bred several kinds of salmon and steelhead trout. How else would the dammed river support any fish? The Elwha Dam blocked everything upstream of River Mile 4.9, roughly 70 miles of riverine habitat. “If it wasn’t for the hatcheries, there probably wouldn’t be a chinook run in [the Elwha] system,” says Roger Peters, a biologist with the U.S. Fish and Wildlife Service and member of the Squaxin Island Tribe. A coho salmon being tagged and measured at the Lower Elwha Klallam Tribe hatchery west of Port Angeles. The Elwha hatcheries came under scrutiny as dam demolition began. For decades, the state, then the tribe, had bred a non-native strain of steelhead in the lower river. Scientists and environmentalists warned that this foreign fish, previously contained to just five miles of river, should not be allowed to colonize the entire Elwha. So the tribe eventually made two concessions: It stopped producing non-native steelhead and agreed to a five-year moratorium on all fishing in the Elwha to help the salmon recover [PDF]. There was one thing the Lower Elwha refused to give up: its hatchery. 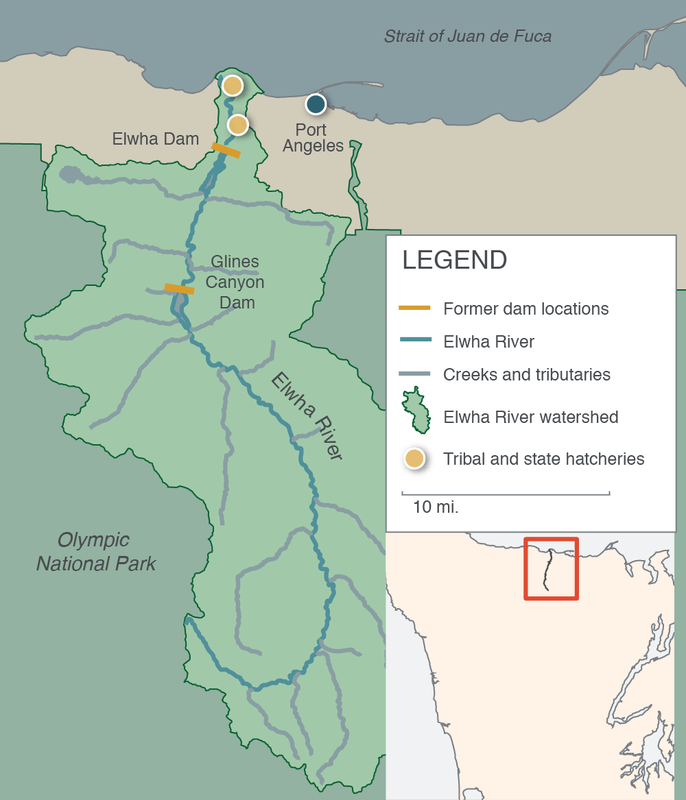 The National Oceanic and Atmospheric Administration’s 2008 “fish restoration plan” [PDF] predicted that the millions of tons of gravel, sand, silt and rocks unleashed from behind the dams could kill hundreds, maybe thousands of Elwha fish, three types of which — native steelhead, chinook and bull trout — were listed as threatened under the Endangered Species Act. Letting the fish recover on their own, without any artificial reproduction, was an unacceptable risk from the tribe’s point of view. Yet the existing hatchery wouldn’t suffice. Dam removal was expected to overwhelm the aging structure due to rising groundwater levels and increased sediment flow. Thus, as part of the restoration, the tribe sought — and received — more than $20 million in federal funds to build a new hatchery. The facility opened in 2011. In photos, the immense complex — off-limits to journalists during the litigation — looks sleek and state of the art, equipped with incubation ponds, rearing “raceways” and a canal out to the river. It’s a point of pride for the Elwha people, whose four full-time workers trap, gaff, fertilize, feed, move and tag millions of juvenile fish every year. In 2015, the tribal hatchery will release 175,000 native steelhead, 425,000 coho, more than 1 million chum and 3 million pink salmon. The Washington state hatchery will send nearly 3 million young chinook into the Elwha and its tributaries. What the tribe sees as beautiful and necessary, hatchery opponents say is destructive and illegal. The lawsuit brought by Wild Fish Conservancy, the Federation of Fly Fishers’ Steelhead Committee, Wild Salmon Rivers and the Wild Steelhead Coalition takes aim at the tribe’s breeding of steelhead, which number between 500 and 1,000 in the Elwha and are notoriously difficult to breed in hatcheries. The nonprofits argue that putting hatchery fish in the newly undammed Elwha will “irreparably harm” threatened steelhead, in violation of the Endangered Species Act. The state’s nearby hatchery, which only breeds chinook, was immune from the suit because of an earlier consent decree. Independent ecologist Jack Stanford, an expert witness for the plaintiffs, told the district court that the tribe’s hatchery “will most likely cause severe and long lasting harm” to native Elwha steelhead. Sportfishing purists agree. “A lot of these hatchery fish that they’re raising on the Elwha are just little rags — little rats compared to the beautiful wild fish that nature has made for thousands of years,” says Dave Steinbaugh, a diehard fly fisherman who owns the Port Angeles store Waters West. The plaintiffs point to studies of Pacific salmon suggesting that hatchery fish do tend to be genetically inferior. In several rivers, manufactured salmon — and steelhead in particular — have had trouble mating and avoiding predators in the wild. Given all this, plaintiffs say, the tribe should either shut down its hatchery or reduce production from millions to tens of thousands of steelhead per year. The problem with the plaintiffs’ evidence, say the federal agencies being sued, is that it can’t predict what will happen on the Elwha. Brian Winter, the National Park Service scientist leading the Elwha restoration, stated in an affidavit that, assuming the worst-case scenario — unrelenting sediment flows and blocked upstream habitat — hatcheries would be the only lifeline for local fish. Yet even the best hatcheries are fragile: In July 2013, a problem with the water pump at the new tribal hatchery killed more than 200,000 coho and steelhead. In their pleadings, the federal defendants express unyielding support for the hatchery. But river watchers and one scientist directly involved in the restoration (who asked to remain anonymous for fear of retaliation) point to dissent in the ranks. They say that many fisheries biologists employed by the Lower Elwha and the National Park Service oppose the hatchery but feel pressure to support the tribe. “Any time you ever criticize a tribe — and I totally understand this — people think there is a racist element to it,” says Beardslee. According to Kerry Naish, a University of Washington hatcheries expert not involved in the case, the science is unclear at best: To prove genetic loss, “you need lots and lots of generations. 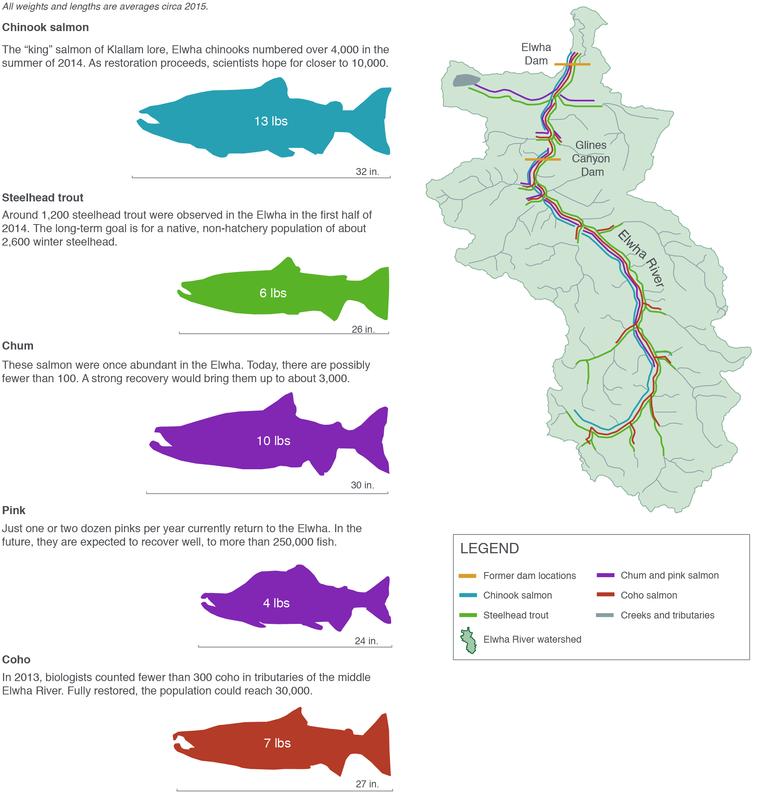 You need to be able to sample every four to five years for steelhead.” Another problem, Naish says, is that in rivers like the Elwha, where hatcheries have existed for a century, so-called wild fish may in fact be hatchery descendants. In March 2014, the district court ruled for the federal defendants on most counts, allowing the tribe to continue its work at the hatchery. But the judge did find that the government failed to consider the option of releasing fewer fish into the Elwha. The plaintiffs’ other claims are now pending before the Ninth Circuit Court of Appeals. Wild Fish Conservancy worries that the new Elwha hatchery will set a precedent for future dam-removal and restoration projects. It’s a particular concern in the West as momentum builds against deadbeat dams on the Snake and Klamath rivers, among others. There’s another, more insidious aspect to the hatchery debate — an echo of the Fish Wars. In salmon country, nontribal recreational and commercial fishermen often accuse Native Americans of taking more than their 50 percent share — and of using hatcheries to increase their catch. “It’s 95 percent the tribe. There’s no enforcement out here,” says Jerry Wright, who owns Jerry’s Bait and Tackle shop in east Port Angeles. “Those fish were originally supposed to be for the tribes, but they sell it to Japan and China. You see gillnets full of rotting fish.” In The Reel News, a local newspaper, articles complain about “Boldt-inflicted tribal fishing rights” and a state wildlife department that bows to Native interests at the expense of recreational sportsmen. Elwha fishers do sell their catch, but “So what?” supporters say. “The fishery is incredibly important to the tribes,” says attorney Eberhard. “People say, ‘They’re selling the fish!’ Well, yeah, they live in a cash economy. They’re also eating the fish.” The Northwest Indian Fisheries Commission, which represents the Lower Elwha and 19 other Washington tribes, emphasizes the peoples’ right to use and manage natural resources as they deem appropriate. Juvenile coho salmon feed at the tribal hatchery on the lower Elwha River. All parties hope for an eventual sunset on human intervention [PDF]. “The plan all along has been to phase out the hatchery as far as the Elwha salmon are concerned,” says Elofson. At this stage, however, no one but Wild Fish Conservancy can say when that should occur. A date for oral argument before the appeals court has not been set. Meanwhile, both the state and tribal hatcheries have proceeded with their spring releases: 296,000 coho, 175,000 steelhead and 300,000 chinook destined for the sea. Hatchery lawsuits plead objective, scientific truth yet delve, implicitly, into the much thornier terrain of tribal sovereignty and resource management. “What is really being balanced are different human values for these fish,” says Mary Ruckleshaus, consulting professor at the Stanford Woods Institute for the Environment. “And that’s not a purely scientific judgment.” Fish biologists, hydrologists and engineers talk about managing the “four h’s”: hatchery, harvest, hydropower and habitat [PDF]. But they can’t and won’t decide what the priority should be — in any river, at any given time. The Lower Elwha’s sacred place, the “creation site” where the tribe originated, was said to lie along the river. In an Elwha history book, it’s described as a large rock with two deep depressions, an altar of divination and prayer “where the Creator bathed the people and blessed them.” But the stone vanished in 1913, drowned by the new Elwha Dam. In the summer of 2012, with both dams chipped away and the river resuming its natural course, the creation site re-emerged. Members of the Lower Elwha tribe hiked up the river and scooped water from the rock’s holes into little bottles. They fashioned them into necklaces for elders unable to make the trip. Today, the salmon are returning, already in the low thousands — not bad by current standards. “Even if we have good runs coming back, we’re going to let them go back to the river for spawning,” says Elofson, referring to the moratorium. By 2017, when fishing resumes, he expects a modest catch, “the equivalent of what we had before.” In another 10 years, he hopes for something much more significant: a harvest big enough to lift the fate of the tribe. Correction: This version of the story corrects the spelling of former Olympic National Park Chief Ranger Chuck Janda's name.